Graded VG-EX 4 (MK) by PSA. 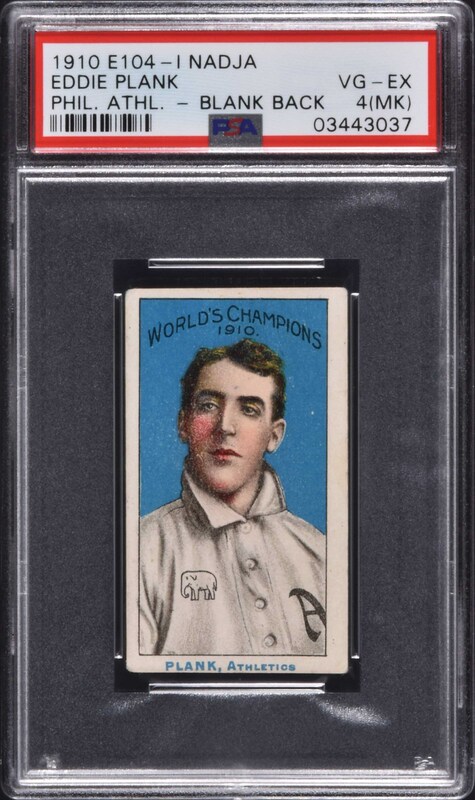 This magnificent example of key Hall of Famer Eddie Plank from the extremely rare E104-1 Nadja Caramels series features a classic portrait image. Highest-graded PSA example (with a VG+ 3.5 close behind). E104-1 Nadja Caramels are among the rarest of all twentieth-century caramel issues. Produced to commemorate the Athletics’ 1910 Championship season, the 18-card set features Philadelphia Athletics exclusively. The cards measure 1-1/2 x 2-5/8 inches, which is the standard size for tobacco issues. They are nearly identical to D359 Rochester/Williams Baking, and another related set of legendary rarity, T208 Fireside Tobacco. The card is bright and clean, with a deep blue background and crisp image. The card has no creases, just a little corner wear, and has been qualified "MK" due to purple ink stamp on the blank-back reverse, reading "Swift" with a street address, representing a specific retail store. This card was the highlight of a 2007 find of E104-1 Nadja Caramel cards, all of which had the "Swift" stamp (in some cases the stamp read "Swift Variety") on the reverse. It is a certainty that this establishment stamped these cards with its name and address for distribution with candy or just as promotional giveaways. All fifteen "Swift" cards discovered were submitted to SGC. Thirteen were numerically graded and two encapsulated as authentic. This card was previously graded "Authentic" by SGC. 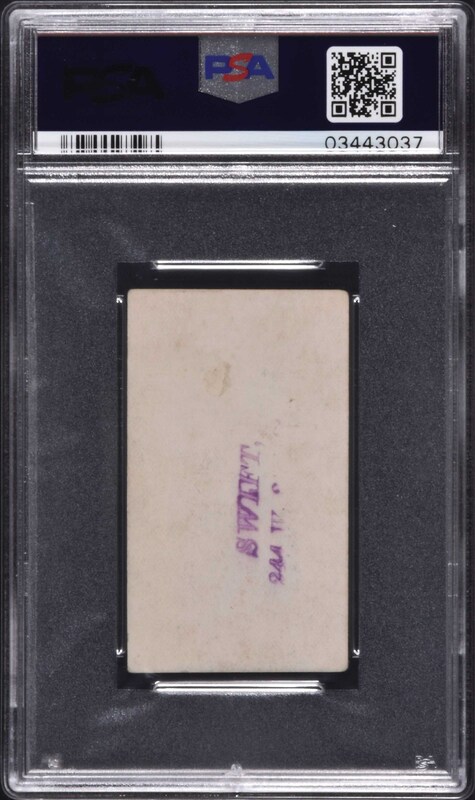 The buyer saw nothing that would preclude this card from receiving a numerical grade, and after purchase submitted it to PSA for review. PSA was in full agreement with him. We also see nothing that would preclude this original find card from receiving a numerical grade. Early cards can sometimes have slightly different cuts, and this card was apparently shorter than others in the find. This is an extraordinary card and a significant rarity that, in any holder, would be worthy of the most advanced collection. This is an extremely striking, very attractive example of one of the rarest of all Eddie Plank cards. Reserve $500. Estimate $1,000/$2,000+.